Dream Chaser, a commercial space plane built by Sierra Nevada Corp.'s Space Systems, is seen at NASA's Dryden Flight research Center located inside Edwards Air Force Base in California. A key test flight of a new private space plane that aims to be a next-generation transportation vehicle for astronauts has become another casualty of the ongoing U.S. government shutdown. 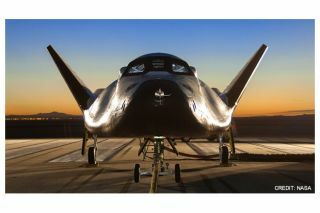 The new commercial space plane, called Dream Chaser, was slated to make a major free-flight test slated on Oct. 5 at the NASA Dryden Flight Research Center, located inside Edwards Air Force Base in California. But because the government shutdown has shuttered most of NASA, Dream Chaser's debut unmanned drop test is now on hold. The private Dream Chaser space plane undergoes a 60 mph tow test at NASA's Dryden Flight Research Center in California in May 2013 ahead of planned unmanned flight tests. SNC is one of three companies — along with Space Exploration Technologies (SpaceX ) and The Boeing Company — funded under NASA’s Commercial Crew Integrated Capability (CCiCap) initiative to develop a next-generation crew transportation vehicle. Of the trio of spacecraft, Dream Chaser is the only reusable, lifting body vehicle with runway landing capability. A winged spacecraft, Dream Chaser is designed to support space station crew transportation for NASA, international and commercial space applications. The space plane is designed to launch seven astronauts and cargo on missions to and from low-Earth orbit. SNC engineers have put the Dream Chaser prototype through a series of ground and captive-carry tests to set the stage for the now-stalled unpiloted approach-and-landing drop. "It has been a lot of work," Sirangelo told SPACE.com. The first Dream Chaser test vehicle has been at NASA's Dryden Flight Research Center since mid-May. It has already completed ground-based taxi and tow tests, evaluated the performance of its main landing gear and completed a flight test readiness review. That was followed by a successful two-hour captive-carry test of Dream Chaser at Dryden on Aug. 22. During that test, the craft dangled under an Erickson Air-Crane helicopter. That assessment cleared several of the Dream Chaser systems and sub-systems prior to the upcoming free-flight test, Sirangelo told SPACE.com. Software was also tested that included flight computer, guidance, navigation and control, the vehicle's control surfaces, and the landing gear and nose skid, which was deployed during the helicopter hoisting flight. The closing of Dryden due to the government shutdown has meant some 50 to 60 Dream Chaser team members being placed in limbo, Sirangelo said. "Not having access to the NASA facilities certainly delays the execution of parts of the program," he added. "But there’s nothing we can do about it. I don't think anybody can do anything about it right now." Even a government back-to-work go-ahead would mean readying the Dream Chaser and the team for the drop test, a situation that would likely take a week of time, Sirangelo said. "But it's not about the vehicle anymore. It's about the logistics of flying," Sirangelo added. "This was not on my contingency list. I thought I had thought of everything." Sirangelo said Dream Chaser went to Dryden and Edwards because it was the right place to be and that's where America should test its space planes. "But we didn't think it would come back and haunt us," he said. Under the NASA CCiCap, the Dream Chaser work doesn't mean the private company is billing NASA every month for its time on the project. "We get paid later when we complete the milestone," Sirangelo said. "We're funding more time, if you will, on the money." On an upbeat note, Sirangelo said that nobody is thinking the government shutdown will go on forever. "It's just a delay a few weeks in my mind." Furthermore, Sirangelo said that SNC is not standing still and is busy at work on future Dream Chaser plans. "Things have gone well and we're ready to fly … and we expect to be flying this year," he said.